The deepest, darkest jungle is the setting for Tropic Reels, a five row and three reel multi-spin slot game that offers players the chance to win cold, hard cash. Boasting colourful and bright graphics and imagery, the slot also offers an impressively high top payline jackpot and features wild symbols to improve the chance of winning big even further still. The slot’s multi-spin feature makes it easier to hit the really high paying combinations and introducing some more interesting gameplay to the equation. A top payline jackpot of £75,000 at the highest bet level is one of the most generous around. A good range of staking options are provided, as players can alter both the number of coins bet per row and the value of those coins. 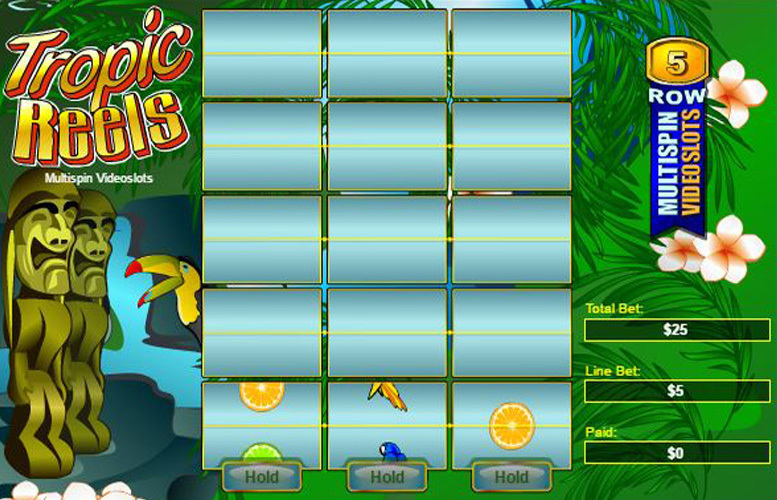 In spite of its multi-spin capability, Tropic Reels is a very simple slot that may get boring quite quickly. Payouts beneath the top payline jackpot are all considerably lower. Graphics and symbols are simplistic and a little dull compared to the more interestingly themed slots that are available. As is the case with many slots, Tropic Reels’ wild symbols are also the symbols that make up the most valuable possible payline combination. Three of the lion’s head wilds, in fact, pay out at a rate of 2500 times the player’s bet per line if they line up consecutively along a row and the player bet the maximum possible amount. At any other bet level, the combination is worth 2000 times the bet per line. What that means is that if a player bets the maximum £25 per line and registers the three wild combination, they would receive a jackpot worth £67,500. That is a payline jackpot amongst the most generous available anywhere. 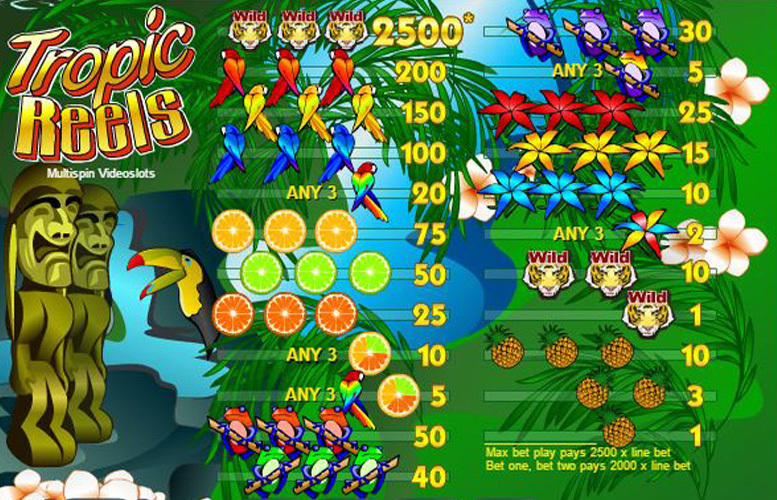 Whilst Tropic Reels is one of the simpler slot games around, it does still include a couple of notable features to make gameplay more interesting and immersive. These are the slot’s wild symbols and its multi-spin capability. As has already been talked about, the Tropic Reels lion’s head wild symbols can make up the most valuable payline combination possible. They do, however, also work as traditional wilds. That means that when they appear on the reels they can substitute for any of the game’s other symbols in order to make up as valuable a combination as possible. Arguably the most important feature of the Tropic Reels slot, its multi-spin capability means that each game round actually consists of two spins. On the first, only the bottom row of the slot’s reels display symbols and players are then given the chance to hold any of those symbols they desire. They can then spin the reels they do not hold again, to display symbols on all five rows. This makes it easier for players to tilt at the most valuable symbol combinations possible. Tropic Reel’s lion’s head wild is the only special symbol featured within the slot’s gameplay, but there are numerous other symbols on the reels. Those symbols are all themed around animal and plant life you might find in the jungle and lining up three matching symbols along the slot’s rows is how the highest jackpots are won. After the wild symbols themselves, it is three symbol combination include matching coloured parrots that are the next most valuable. Three red parrots pay out at a rate of 200 times the bet per line, three yellow parrots return a jackpot of 150 times the bet per line and three blue parrots result in a 100 times payout. Like most multi-spin slots that utilise rows rather than traditional paylines, players cannot alter the number of rows which are active per each Tropic Reels spin to regulate their stake amount. What they can do, however, is to alter both the number of coins they bet per row and the value of each of those coins. Coins can be worth anything between 1p and £5 each and anywhere between one and five coins can be wagered on each row per spin. That allows a player to bet a possible minimum of just 5p or a potential maximum of £125. If you like multi-spin slots but want to keep things nice and simple, then Tropic Reels is probably the perfect option for you. The slot offers an impressive top payline jackpot of £67,500 and is also really quick and easy to learn and to play. Aside from the multi-spin element of the slot and the inclusion of a traditional wild, however, gameplay is extremely straight-forward and quite repetitive. The symbols and graphics are simplistic, too, and that means that if you want an immersive and a more involved game to play, Tropic Reels is not going to tickle your fancy. This game has a rating of 3 / 5 with 356 total reviews by the users.